Truly more than just another 18 holes, this Tom Jackson signature course is a gold nugget in the Santee Cooper Country golf scene. 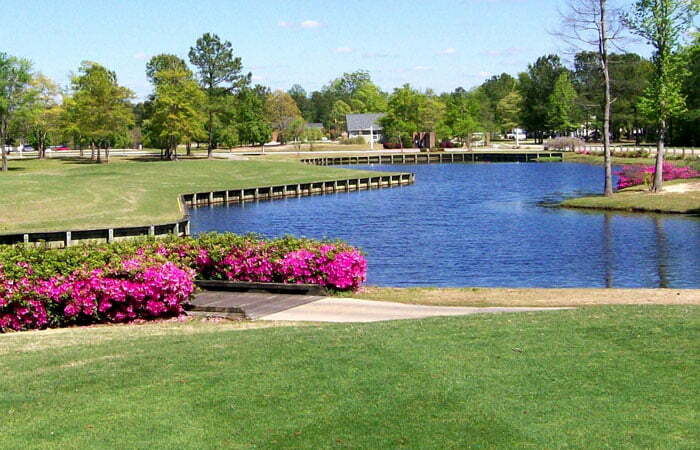 Wyboo Golf Club is conveniently located just 8 miles south of Manning, SC (off I-95 exit #108) and across the road from great evening entertainment at The Palms Restaurant. Play Wyboo once and you’ll be back! I-95 North to exit 108. Turn right onto M.G.Hemingway Road and go 1.5 miles to stop sign. Turn left onto Bill Davis Road for 6.3 miles. At Davis crossroads turn right at the Davis Station onto M.W.Rickenbaker. Go 1.3 miles and take left onto White Oak. Go another 1.3 miles and turn left again onto Players Course Drive. Course down on left. Features: Club Pro Shop, Snack Bar, Members Room, Driving Range, Practice Green, Carts, Lessons, and Club Rental. Dress Code: No tank tops or cut-offs.